What is in Leeudoringstad? Not much, and where is Leeudoringstad? Its near the Vaalriver in the western part of the Transvaal (sorry for using the old name, its the North West province now), between Wolmerandstad and Orkney. 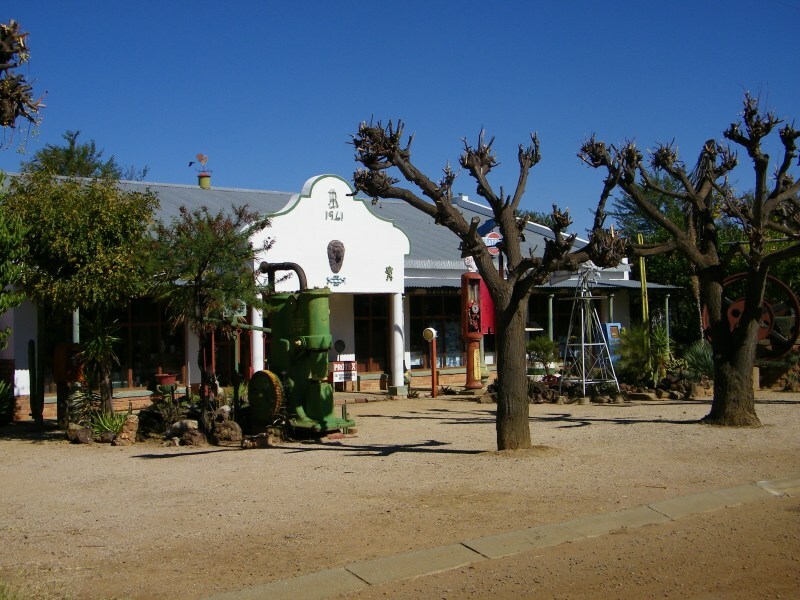 The town was established in 1920 and named after the already existing railway halt. 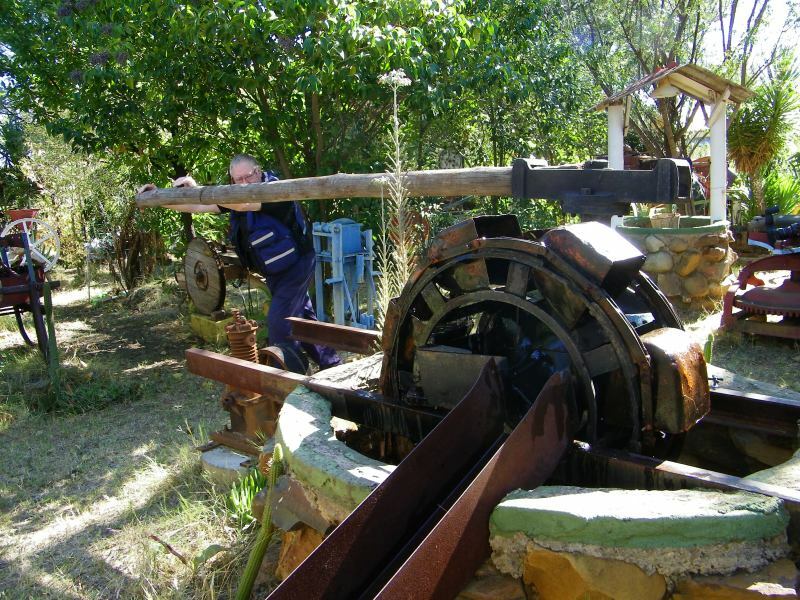 What makes this place interesting is that in it lives Koos Roussouw with his collection. Koos is one of those amazing collectors, he collects everything not new. There are old cars, motor bikes, agricultural machinery, engines, kitchen utensils, tools and many more things. The collection had become so large that he had to buy another property just across the street and a vacant stand to accommodate everything, and it is still growing. He doesn't charge anything to look at the old things, although a donation is welcome. And nothing is for sale. A significant event happened here at the station in 1932 when a whole train loaded with 320 tons of dynamite exploded, killing five people, damaging nearly every house in the town and killing numerous live stock. Bits and pieces of this bang can be found in Koos's collection. According to a book in my possession: A.P.Cartwright "The Dynamite Company", it was a goods train delivering explosives from the Cape Explosives Factory to the Rand, there were thirty-one trucks loaded with 10685 cases. Just outside the station, about 1 km down the track, the driver noticed a cloud of smoke coming from one of the trucks in the middle of the train. He immediately stopped the train and was about to get down from the foot plate when an almighty explosion occurred, well actually a succession of explosions as each truck in turn got blasted. Miraculously the driver and his fireman escaped unharmed and managed to uncouple the engine and take it into the station to warn the people there that there could possibly be more explosions. The guardsman, Sarel van Wyk, was not so lucky and he was blown to pieces. A nearby farm house received the full blast and four people in there were killed instantly as well as most of the livestock. The board of inquiry found that the initial fire was due to the trailing axle of the first dynamite truck had become hot and ignited the grease and oil in the axle box. And what saved the driver and fireman was that by regulation there had to be three empty trucks between the engine and the first explosives truck. Piet Vermeulen of Leeudoringstad has produced a YouTube video about the event. We did have a look at the station as is customary when we visit a town. 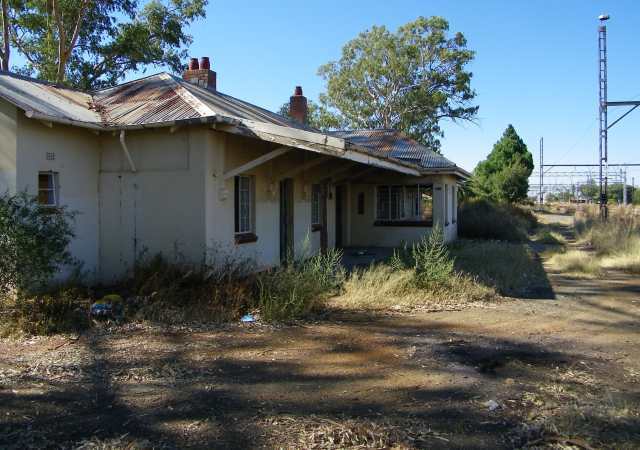 The rails are still in use but the station is not and in fact as we see so often the station building is left to the elements and is rapidly deteriorating. Why doesn't the railways rather sell these buildings?